I’ve been hearing a lot of hype about all of these “one pot” pasta meals and kept wondering what the big deal was. I finally gave in and tried one out when I was looking for a hearty side dish. Well, we were pleased! And who was the biggest fan of this one pan wonder? The little one in the house. The concept makes a lot of sense, since you’re basically doing the same thing you do with rice, risotto, couscous…you’re cooking the pasta in the liquid that it’s being served in. Or if you throw pasta in soup, which I do often. No matter what, we really enjoyed this, and have made it a few times since first trying it. Naturally, I upped the garlic for some extra flavor, and I’ve been making it with pasta other than fettuccine. Definitely give this a try – especially during the busy holiday season! Combine all ingredients except cheese in a pan. Bring to boil and stir. Reduce to simmer and cover. 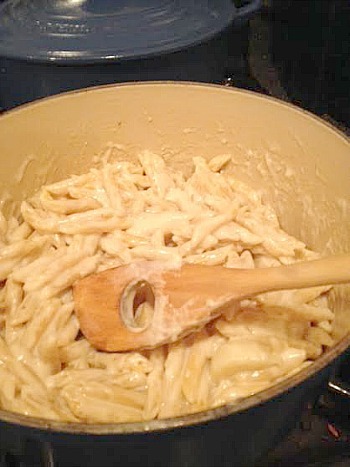 Let cook 15-20 minutes, or until pasta is cooked. Remove pan from heat. Take garlic out and stir in cheese. Add more pepper, if desired, and serve immediately. 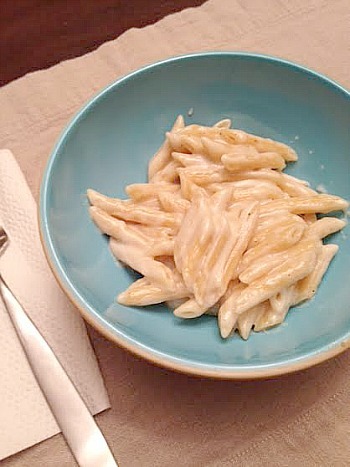 This entry was posted in cheese, main dishes, pasta, QuickAndEasy, side dishes. Bookmark the permalink.